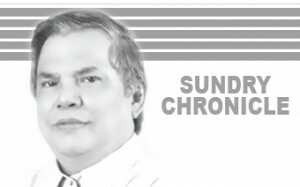 As we go on our daily routine we could hardly notice the years that have gone by.Â On July 1, 2016 the City of Tagbilaran will be 50 years old and last March 17, 2016 was the 25th year of my column â€œSundry Chronicleâ€. For the sake of posterity these are events worth commemorating and if possible â€“ celebrating. R.A. 4660 otherwise known as the â€œCity Charter of Tagbilaranâ€ was signed into law by Pres. Ferdinand Marcos at the MalacaÃ±ang Palace on June 18, 1966.Â It specifically provides that the City of Tagbilaran will begin to exist on July 1, 1966. The Bill was sponsored by the three congressmen of Bohol: Natalio Castillo of the 1st District; Jose Zafra of the 2nd District; and Teodoro Galagar of the 3rd District. It was Vice Mayor Luciano Pamaong who did the yeomanâ€™s job of preparing all the papers and following up the papers until it was signed into law. Present during the signing were: President Marcos, Cong. Castillo, Cong. Zafra, Sen. Lorenzo Teves, Sen. Rodulfo Ganzon, Mayor Venancio Inting, Vice Mayor Luciano Pamaong, Councilor Heliodoro Zamora, Atty. Zoilo Dejaresco Jr., Treasurer Arturo Fortich, Constancio Soria, Chito Castillo, Purisimo Castillo, Eleuterio Zulueta, Policronio Canda, Eufracio Rara Jr., and Froilan Relampagos. When July 1, 1966 came the officials of the Municipality of Tagbilaran that were converted into City Officials decided to have only a simple program to commemorate the event.Â A Holy Mass was offered at St. Joseph Cathedral and a simple program was held at the City Hall after the Mass. The new City Officials were: Mayor â€“ Venancio Inting; Vice Mayor â€“ Luciano Pamaong.Â The City Councilors were: Francisco Bustrillos, Teodorico Majarocon, Eliodoro Zamora, Pacifico Cabalit, Gabino Ligason, Patricio Pizarras, Romualdo Lumantao, and Jose Torralba. During the Silver Anniversary (25th Year) the same simple commemoration was held.Â Now as the Golden Anniversary (50th Year) is approaching it seems that the City Officials are not agog in preparation, so we will expect another simple commemoration. However, last May 1, 2016 the City of Tagbilaran spent millions of pesos for the â€œSaulog Tagbilaranâ€ for the City Fiesta.Â The Sugboanon word â€œsaulogâ€ means celebrate in English.Â Why not celebrate also for the Golden Anniversary of Tagbilaran? On noon of June 30, 2016 the newly elected and re-elected officials of Tagbilaran City will take their oath of office.Â Why not make a lavish or pompous celebration the next day, July 1, in order to celebrate the assumption into office of the new officials and the Golden Anniversary of the City? All the while I was thinking that I started writing the â€œSundry Chronicleâ€ on June of 1991.Â When I looked at my records it turned out that my first article was on March 17, 1991.Â I got confused with the June 20, 1993 when I was given unlimited length for an article. When I first approached the Late Atty. Zoilo Dejaresco Jr. that I would like to write a history column, he agreed with the following proviso; the article will be type written in one short bond paper and double spaced.Â Therefore the articles will be very short. I started with trivia informations about Bohol.Â Later on I typed my articles as single spaced in a short bond paper to have a longer article. So on June 20, 1993 I started writing my seven (7) series article about the Eskaya of Bohol.Â It was a good series of articles that became the documents used to recommend the Eskaya of Bohol as a cultural minority.Â President Fidel Ramos signed the Executive Order recognizing the Eskaya of Bohol as a cultural minority and allocated them a 3,000 hectares ancestral home. Twenty-five (25) years is 9,125 days and divide it by 7 will equal 1,303 weeks.Â So I have written about 1,200 articles about Bohol (some are series). Twenty-five years ago the historical informations about Bohol were based on traditional stories, folklores, and conjectures.Â To my mind the Boholanos ought to have informations based on facts from primary sources.Â Since nobody was doing it, I resolved to do it myself.Â I spent lots of money in securing original papers.Â I spent more than I was paid. Since I am an engineer, I have to study and earn my Master in History degree and finished it in 1995.Â I finished my Ph.D. in education in 2002 with the establishment of the civil towns in Bohol as my dissertation. Together with the love of engineering and history, I also studied the Sugboanon BisayÃ language after I was recognized by LUDABI in 1992 as an authority in BinisayÃ¢. My main thrust now is the development and teaching of the BinisayÃ¢.Â My 31,000 entry Bisaya-English dictionary is now upgraded to 38,000 but my English-Bisaya thesaurus is still at letter â€œPâ€ with already 29,000 entries.